'The NTK Project' what is it exactly? Who are people concerned by The NTK Project? How to install and configure NTK? How to make a NTK Project application? 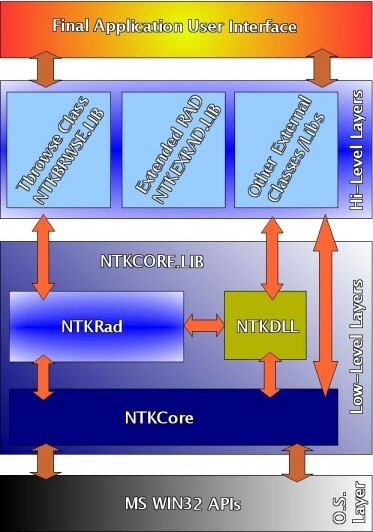 What does mean core layer,ntkdll layer and ntkrad layer? Where can I find The NTK Project documentation? What's the difference between Free-Training, Pro, and Premium version? - If you're tired of cool modern languages that could be great if only they were supplied with a true compiler! - If, if, ... STOP! At this stage NTK project is only available for xHarbour using the latest version of Borland CPP. So, before to built our first NTK GUI program, it is necessary to correctly configure the programming environement. To do so, the following sections propose a quick and useful help guide. - NTK Project is a third party library working for and with xHarbour RDBMS. - NTK Project and xHarbour require a C compiler to produce executable applications. - Without a GUI library like 'The NTK Project', xHarbour can only create Win32 Console (Text mode) executables. - For the moment, NTK Project doesn't support other C compiler than Borland CPP. So those three products have to be downloaded, installed and correctly configured to work properly together, as expected. As said in the above, Borland CPP compiler is required. DON'T WORRY - Using The NTK Project, you'll never have to deal with it. The C compiler is just invoked in a transparent way, during compilation and linkage phases, to transform all your .PRG files into a unique .EXE (executable) file. For further details, have a look to the Getting Started Manual in the download section. Please refer to chapter 0.6, Part III of the NTK Project's GETTING STARTED guide. Please refer to Part IV of the NTK Project's GETTING STARTED guide. What does mean core layer, ntkdll layer and ntkrad layer? NTKCore is the 'low-level' engine of NTK Project. For the rest, we also call it The Magic Blue Box! All other (actual and future) layers and libraries remain on it and are (and will be) architectured around it. NTKCore layer is a set of low level functions allowing to perform direct calls to the Win32 API. NTKCore, it's about 400 functions that are same or very close to originals provided by the Win32 API. BOOL GetMessage( LPMSG lpMsg,         // address of the MSG structure. NTK_GetMessage( aMsg         ,;  // array of 7 items each one represents a MSG member.
) // The Return value is logic: .F. or .T. In other words, with NTKCORE, the developer (you) will be able to build 32 bit GUI applications using the MS-Windows 'traditional' manner. That is to say : events or messages handling and processing. By the way, you will provide fast and powerful GUI features to your [x]Harbour programs without know anything about C/C++ language and its constraints. So, just by adding NTKCORE.LIB to your application MAKEFILE, the magic world of Win32 APIs will be yours! Though, practice of this kind of programming is beyond the scope of this manual, feel free to learn more about the MS Win32 API programming, reading the famous 'Petzold book'. It's really worth while having a look to it. It certainly would be a great and serious benefit! This layer has been especially created to offer the possibility to reach directly from a NTK/xHarbour program, most functions (Complex C++ functions or classes cannot be wrapped with NTKDLL. This will certainly require writing of some extra C code to be done.) of the Win32 API that would not be included in NTKCore or functions that would be stored into other OEM manufacturer DLL. - Using the combination of NTKcore's functions ( NTK_LoadLibrary, NTK_GetProcAdress NTK_CallDll ). Using the NTKRad's command (DECLARE FUNCTION Myfunc LIB MyDllName.Myfunc ...). *** ShellAbout() WRAPPER using the RAD command: Declare function or _DLL function. *** Returns : A numeric value. 1=Success OR 0=fail. // The following syntaxe works same as the above. Do not hesitate to try it ! // It has been created for NTK's backward compatibility with 16 bit Clip4Win apps. // ---------  C4W like declaration style...  For Backward compatibility! Have a look to CRW32.PRG in the contribs folder of NTK Project. You will see a fully functional set of wrapped functions for the Crystal Report API printing engine ! Based upon NTKCore layer, NTKRad is brought to the xBase developer with the main aim to hide the hard stuff that is handling and processing messages when you're programming MS-Windows 'the traditional' manner. So, developing applications using NTKRad is just kidding for an xBase programmer, because most common xbase commands and functions are available for GUI mode. In fact, developer only have to take care about two important things. - First, keep in mind a NTKRad application always start with at least the minimum following declaration command: CREATE WINDOW hWnd TITLE "My title..."
- Second, as it is well known, in a graphical environment, functions or commands like SAVE SCREEN or RESTORE SCREEN do not work anymore. So, this not absolutely required, but it is strongly recommended to gather all @ y,x SAY ... commands and other screen output commands inside a unique place where MS-Windows will come to peek, and then, take order of what he has to do when the current working window need to be painted/repainted. As you can suppose it, the DoRepaint() procedure/function will have to receive all the @ y,x SAY ...and all other screen output orders. Then, NTKRad does ALL THE JOB FOR YOU and tells MS-Windows what it has to do, each time a portion or the whole window context need to be refreshed! NTK Project manuals are localized into /WNTK4HRB/DOC directory. - GSTARTED.PDF - The GETTING STARTED manual. - FLIST.PDF - A quick memo guide for NTKCore APIs - summary of arguments and return value for each function. - NTKCORE_PART1.PDF - Electronic manual describing the whole NTKCore APIs. - NTKCORE_PART2.PDF - Electronic manual describing the whole NTKCore APIs. - NTKRAD.PDF - Electronic manual describing NTKRad commands and functions. - Use the GREP tool or the Windows Search mechanism to seek the wanted function into all PRG samples through the /WNTK4HRB folder and sub-folders. Keep in mind that PRGs provided ARE TUTORIALS! - Use GREP tool or Windows Search to seek the wanted string into all .CH localized into /WNTK4HRB/INCLUDE folder. - If you're looking for information about NTKRad commands, try exploring NTKCMD.CH & NTKCMDEX.CH. A lot of RAD commands are declared inside. - Post a message on the forum. Maybe someone of NTK's community can point you the right direction. - Then, only if you really don't find anything, post a message to our technical support.